after the end of the Financial Year I asked the CFO what the profit line was looking like. He replied" whatever you want it to be". A now-retired friend who was a university president for a number of years told me that whenever a dean or professor came to his office to ask him for money for some worthwhile activity he had two choices. If he turned to his business manager and asked "do we have money for this?," the answer always would be "no" because there never was enough money to do everything that needed doing. However, if he wanted it to happen he would turn to the business manager and say "I need you to find the money for this," because it was a huge university so money always could be shifted from something to something else. It details how the build process worked at Meriden, no doubt a similar regime operated at Small Heath with some changes. Between March 1957 and 1973 Triumph at Meriden produced some 75,000 �C� range machines along with the numerous other Machines in the Triumph range. I have been fortunate to interview John Nelson who wrote the following article. I am always amazed by the vast range of questions that are asked regarding the production of motorcycles from the original factory in Meriden. Most can only be answered from the �incomplete� records made at the time, and the memories of the dwindling few that worked there, and still exist (and retain their memories)! My first statement is that there was no one at the factory who was detailed to study and record each individual machine and function so that he could recall precisely sixty years later. What records that were kept were for business and legal purposes. Secondly, Triumph was not just a motorcycle assembly shop from bought in finished components as were many other makes. When I joined in nineteen fifty, they made their own pistons, frames, gears, shafts, clutches, wheel hubs-polished and plated their wheel rims, handlebars, silencers in modern paint, polishing and plating shops. The machine shops manufactured almost every part for engines and gearboxes, and all was subject to very strict inspection and quality procedures. So! How did it all work? In the nineteen fifties and sixties, Edward Turner was in charge. Each year he approved design changes, and new models down to every nut and bolt. Most proposed changes were submitted by Sales for acceptance following market trends and Distributor and Dealer requests. 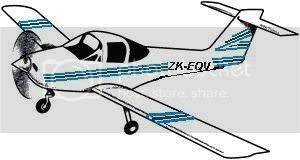 Once agreed, the new seasons models were specified by the Design Department, and a specification issued for each model, by part number detailing quantity, material, etc. indicating �new� where appropriate. When these were issued, Sales issued a programme of forthcoming sales requirements which went to the Purchase and Production departments. Purchase had to schedule deliveries of raw materials to cover manufacturing requirements in time for Production to commence at the proposed date. Tallies were issued to each section in the factory detailing quantities for each individual component in scheduled batches for delivery in time for inspection, and transfer to the central �finished � stores. The finished stores was in a central position in the assembly area, midway between the engine and gearbox assembly tracks, and the motorcycle final assembly line. By this time, the Sales departments (Home and Export) had collected the forward orders for the forthcoming season, and converted these into coloured cardboard Tallies (White for Home and General Export, and Pink for Overseas Markets), detailing individual model, destination, Distributor or Dealer, additions to specification, packing and despatch etc. All these Tallies were collected in single model and destination batches and passed down to Production and Planning to be attached to the bare assembled frames, forks and wheels and handlebars, as the machine was placed on the final assembly track. By this time the Engine Assembly track, on the other side of the finished stores, was commencing build of the new seasons specification engines. Nothing had a frame or engine number at this point. 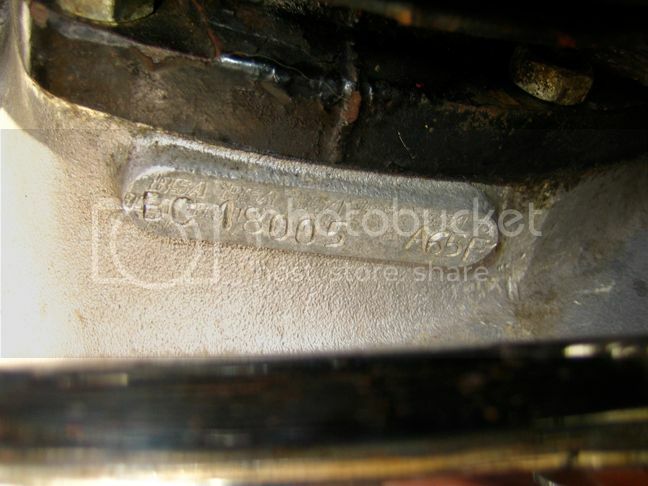 As the engine �grew�, and after the pistons and barrels had been fitted, the designated operator sequentially stamped each individual letter and number on the crankcase, whilst standing by the engine at waist height, (not easy!) and then recorded it in the build book. Passed on to the next operators, the engine was then completed, collected in a batch at the end of the track, and then shipped in batches round to the final assembly track, and fitted into the next frame going down the line. The engines were picked from the engine bench supply in random order and it was not until the last operation on the finished motorcycle, just before it was passed down to the testers that the frame number (taken from the engine number) was stamped by hand, using individual stamps on the headlug -(later an adhesive label), and the number entered on the Tally, and then into the build register. On rare occasions, due to frame hold-ups, large stocks of engines gathered awaiting build, and no attempt was made to ensure they were segregated and then fitted in chronological order. An engine was a bike; which was an invoice, and an income. When passed test, (or rectification, and then re-test) the machines were delivered to the Despatch department, stripped as required for shipment, packed, crated - or delivered by truck, as specified. A dispatch record of every machine was also logged by the despatch department, the completed Tallies were then returned to the Sales departments, and the final records completed�.and the invoices dispatched. During every stage of the above procedures, there were a large complement of progress chasers, based in the production department whose sole job was to ensure the material from the �rough stores� was presented to the various machining sections in time for each batch manufacture, heat treatment, plating/polishing in accordance with the schedule, and available in time in the central stores for each day�s supply to the tracks in accordance with the day�s model build programme, (and as you will appreciate, the constant supply of finished material for the Spares Department).. Everyone knew the programme, and what they were building, normally starting with 650 6T�s TR6, T110, and T120, in those days, and eventually 750�s TR7 and T140�s. In the early days 350/500�s and Police and military were usually at the end of the sequence. Then it was all round again and no going back to earlier models. New models were usually introduced immediately following the Annual Works Holiday, when a skeleton staff had been retained to install the new jigs and fixtures to be used for subsequent production, and a number of dummy runs made to solidify any new installation procedures required for the return and start-up when the operators returned- so all was ready to go! This was the time when the routine changed to supply the U.S. with early consignments of the new models, so they could be shipped and distributed and displayed across the USA in time for the spring selling season. 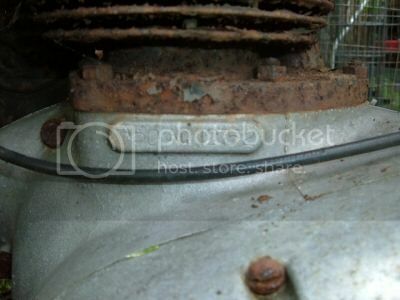 Imagine what happened when the new frame from Umberslade was introduced three months late, and then the engine couldn�t be installed. The entire selling season was lost, and the decline set in. Thanks so much for that Kommando. I am sure we can now draw parallels to the Small Heath production system. Now we can see mention of where in the production sequence the various numbers were allocated. I think it is very timely post and is about to be read and digested every which way. It will give us much to discuss. Based on the various Unit Single crankcase sets I have seen over the years for 69/70 at least the engines had the date and number sequence stamped first eg BC11001 B44, then later in bigger letters the SS or VS was added to make BC11001 VS or BC11001 SS depending on whether the model was a Victor Special or a Shooting Star. So there were some extra wrinkles which are governed by whether the frame and/or engine defined the model, for the B44 the frame said whether the B44 being built was a VS or SS as bracketry and the lugs for the centre stand defined the model. My observations of A65 engines and the stamping would suggest the engine was stamped A65 12345, A50 12346, at the first juncture. The second lot of stampings would be the model code and Date/Year code. I am thinking the frame was stamped with the complete number at this point as well. Perhaps the Y engines were handled in a slightly different manner. When the engine stamping guy was squeezing in his Y numbers for the day, he may have put the whole works on the engine at the one time. He would be handed a list of Y numbers in the morning, say TA Y's when Thunderbolts were on the main production line. By stamping the whole thing at once, it would certainly make things easier for the second guy that was stamping the dates, models, and the frames. You would know better if this was a possibility Kevin, can you see that based on the style of stamps? It would have had to be early on in the engine build process with the Hornet and Spitfire having different pistons, the Royal Star having a different cam, and the 3 different heads and valve train that was used. I think I agree that the Y bikes were probably handled differently as far as the first stampings were concerned. I mean when the engine number was first placed on. I would need to look into it a little further but I think it gave complete flexibility as far as what the model was going to be. Going from Kommando, and Rich B in an email to me, I can see the bike is made from the Tally Card. It has all the build specifications and customer requirements on it. At this stage the bike does not have a serial number. We don't have an engine for it yet. As the bike is built up the engine (with S/N) is added. The engine does not know what model it is at this point. Those details are on the tally card. Likewise the bike has now just discovered it's Serial Number as it was derived from the engine. Once the almost completed bike is nearing the end of the line the final numbers are added. The Frame gets the whole shebang while the engine gets the Month/Year and Model codes. 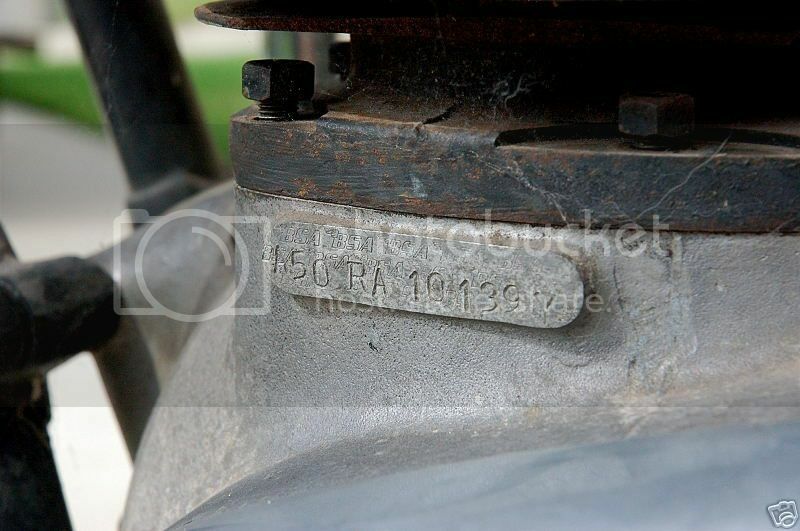 I have seen a Royal Star engine where the RC date code was completely different font. I realise there were different styles and sequences used over the years in question. What Stuart said did make perfect sense though. We may remember the pic of the last few despatches of the EC A65 bikes. It was possible to convert them from Firebirds to Lightnings because the model had not been added to the engine at that point. Similarly with the Firebird engine which we suspect may have been originally intended to be a Hybrid Spitfire. This is a Y model Royal Star made sometime after Nov 1968. There is not much else I can add to that at this stage. All relatively normal and nothing unusual there. This is an early season normal A50 Royal Star. I think probably Sept 1968. We have the raised pad and the new font stamps. The pad has not been machined yet and we still have the very early model year designators. We can see the RC are of a different stamp set than the new set in use. This is the 1968 engined Firebird. Last edited by Kevin (NZ). ; 08/03/13 6:53 pm. The Tally card sounds like the build card we used at Longbridge, there was a room with 3 weeks worth of build cards and each build car specified a Sales order and the vehicle specification. Every week one weeks worth was sent up to the end of the track and as each body dropped on the track a VIN was generated, first operation on the track was to stamp the VIN plate and the body. The trick was to match the painted bodies in the body store with an engine in the engine store and the parts on the line which matched a build card specification. If you did not have a build car that matched all the available parts the line stopped. The body store held up to 300 bodies but things got interesting when the paint shop on a Monday morning took 3 hours to sign off the first good body with all the dirt in the air, 100 bodies were in Forestry Commission green with no matching low compression engines to fit them so no joy there. Suddenly it was hand to mouth with chess game like tactics to get to the end of the shift without the line stopping. Thanks again, You and Stuart will have a much better idea of how the assembly sequence flowed than me. I was sure the engine was never fitted to BSA frames in a sequence. For example if they were building Royal Stars that day someone would sort out a batch of 500cc engines. They would not appear in any particular order. The caption may well be unnecessary. Last edited by Kevin (NZ). ; 08/04/13 7:07 am. Yes, it would have to be identifiable, as an A50 at least, from the point the cam was installed. So, he's stamping A50 or A65, and the number, on the left side case just before the cam goes in, or he's doing the stamping just after the two cases come together. Stamping the case half on it's own, just prior to the cam etc., would be the simplest. This is the number that just keeps giving and giving! If my theory is correct about the engine stamper applying the complete number/model to the Y engines, he would have fully applied this one as well. 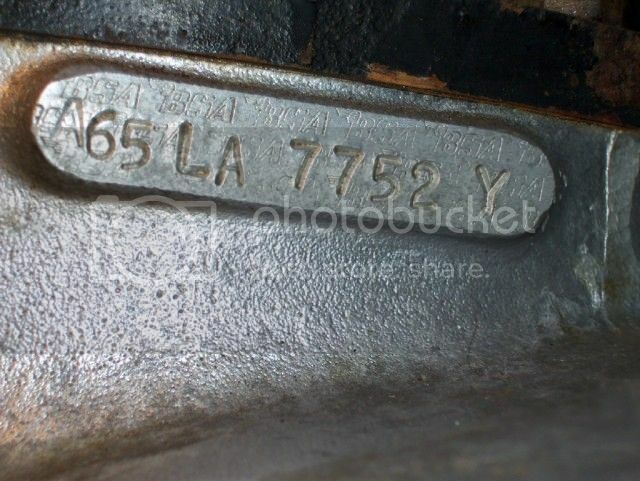 We know this number, 17685, was in the Y bike range for 1968, it was not in the regular range which ran from 101 to 10918. So he stamps it, but doesn't apply the B or the Y? And not applying the B is not really unusual, it wasn't used on any of the other 1967 numbered bikes produced in the 1968 season. Stamping an A for the year wouldn't make sense of course, there were no Firebirds in 1967. 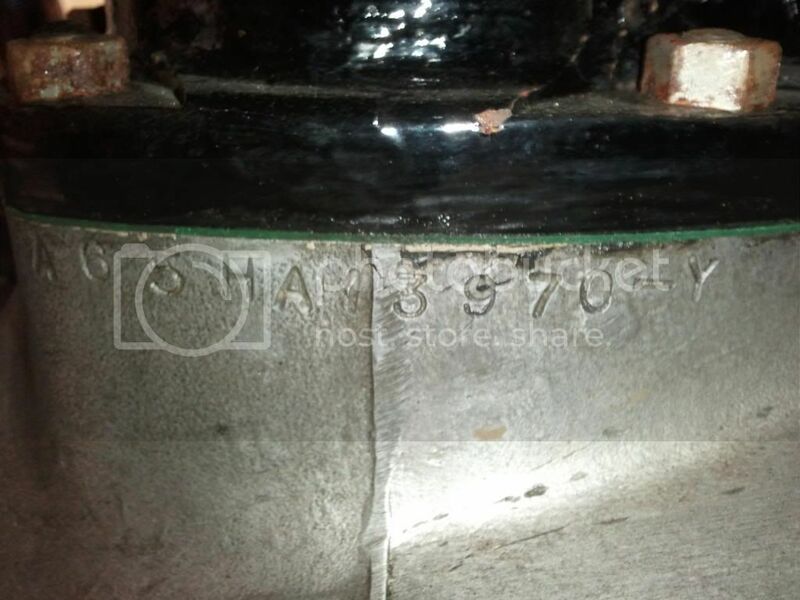 It would seem that the most likely scenario was that "A65F 17685" was decided upon before the engine stamper got his list of Y numbers, it was stamped on the engine, and then the second stamp person just transferred that over to the frame. Guess they needed one more Firebird. * This is a weird one though, the need for a Firebird appears to have trumped the need for a Y bike. I'm not sure what to make of that. Last edited by Two Alpha; 08/03/13 8:14 pm. Reason: fine tuning, add last note. Having thought about this for a bit, they would still be able to claim that this was a replacement for the 1967 bike, the number portion is still the same. The only thing they're missing without the Y is the identifier that it's a later year, and the F kinda takes care of that. ...Yes, it would have to be identifiable, as an A50 at least, from the point the cam was installed. After reading his post, I do not think Kevin is buying in to this. In regards to the '67 F machine, maybe it was just a matter of the stamping guy grabbing the wrong stamp. "Oh well, I'll just let it go on down the line like that, it's almost quitting time anyway." Ha! That's another possibility, at least he wouldn't be scratching his head for very long, the next bike would be upon him soon enough. I haven't done enough work on any of this. That RC number caught my eye the other day though and That was just after Stuart had told us what Triumph did. I had doubts when I posted those pics last night. I have just woken now. The RC bike is one of the very first to receive the new font. When I compare the letters RC to the letter A I think all are a smaller size. What I took to be the RC being stamped later may indeed just be a mismatch in size in the original use of the small (changeover) stamps. As for the F Firebird. It is a 1968 engine, very likely identical to the Hybrids. It does have the big F associated with 1968 stamps. My thinking was that Hybrid block of numbers may have had the model designator stamped at a later stage of the assembly. ie towards the very end of the line. I have just been forwarded pics of a Dash Y Spitfire. 13500. It fits in well and shows us something as that table is very full about it. The numbers are as mix of models, A65T and A65H. I hear what Gary has had to say about the engine physical difference and also wondered how that was going to work. Oh, and I have just seen some rather good photos of a Mk III Spitfire A65SA13500-Y. The pics show a nice clean example looking very pretty indeed. It is interesting in where this Spitfire sits on our spreadsheet, or rather is it 13495 that stands out. At the moment we have one Thunderbolt sitting amongst a whole batch of Spitfires. A65TA13495-Y is not one of my numbers. Do we need to check that to see if it may be a Spitfire number ? Last edited by Kevin (NZ). ; 08/04/13 7:03 am. Well spotted Kevin, it's A65SA in my records, must have had TA on the brain when I entered it on the spreadsheet. Here are three engine stampings from 1969, one Y and two regular. This one, the Y bike, has a dispatch date of 1969-02-20. To me, it looks like everything but the first A was applied by the first stamper. The two A's are different, and the L has a rounded lower left corner. This one is from a bit earlier, October of 1968. The A is the same as the first A in the previous picture. The L has a squared lower left corner. 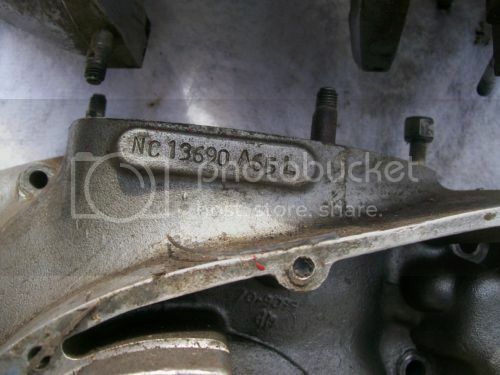 In this case, it appears that the engine stamper applied the NC 13690 65, and the second stamper applied the A and the L.
The dispatch date for this one would be close to that of the one in the first picture, February of 1969. The A is the same as in the second picture, the same as the first A in the first picture. Here, in a similar manner to the second photo, it appears that the engine stamper has applied the BC 18005 65, and the second stamper has applied the A and the F.
It makes sense to me that the engine stamper would apply almost all of the Y number, he would be the one with the list of Y numbers to squeeze in. The second stamper wouldn't need a list, he's just going by what the first stamper has sent his way, and whatever model they're doing at that particular time. The second stamper really doesn't need to stamp much on the engine, just one or two letters. It almost seems that they left the first A off on the Y engine just so that the second stamper would have to stamp at least one letter on those engines. A65HA13970-Y. 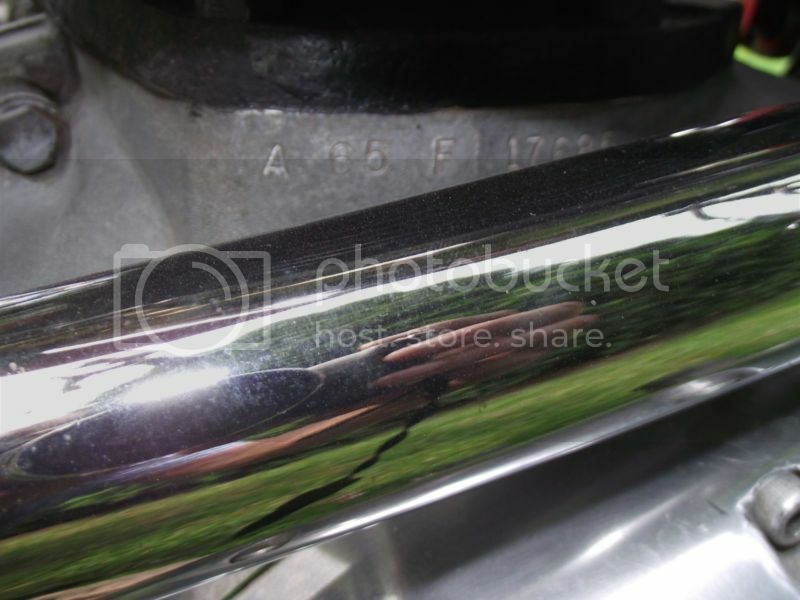 Frame # is A50B90xx.Titled as 1966 Hornet. Thanks for the picture AlZ, I've added it to the spreadsheet. Don't remember if this was ever posted. That really blows the BSAOC version out of the water. The increased warranty was the brainchild of Peter Thornton. It would appear it may not have been thought through and of course the extra cost of doubling the warranty period had a crippling effect. We should remember the first Y bikes on our spreadsheet were being shipped in Feb 1969, a full year before this warranty document. Peter Thornton did not even join BSA until Aug 1969, ie, six months after the Y bikes were being shipped. 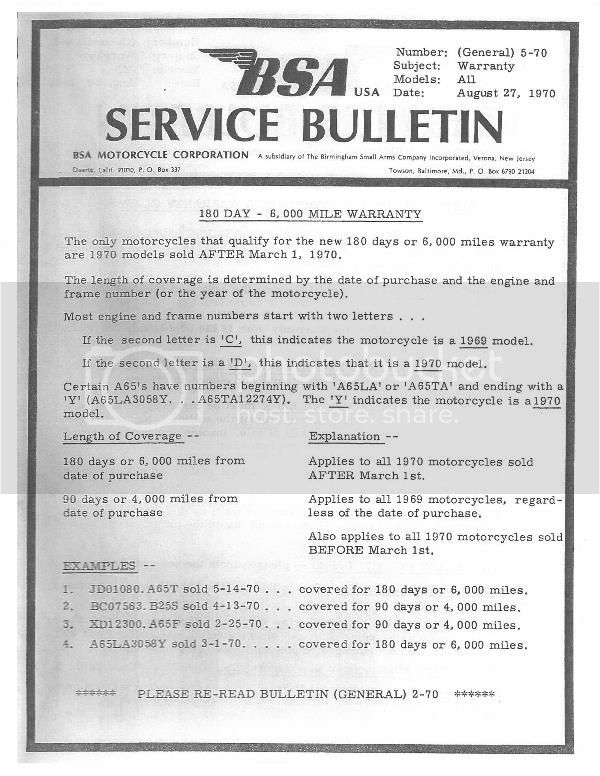 You don't need to read the Bulletin too carefully to see that th 180 day warranty applies to ALL BSA (and Triumph also) models that were 1970 models and sold after 1 March 1970. This would be B25, B44 as well as the unit twins. What we have there is an admission by BSA that the Y bikes did exist and were indeed 1970 models. We are smart enough to know that any unsold 1969 model Y bike would also be covered if it was still in the showroom by March 1970. I am guessing there may have only been a small chance of that anyway. They should have been in the showrooms well before Xmas 1969. I have also heard from Alan in the UK. we spoke about his Dash Y bikes the other day. I see the list includes my 1967 -Y Lightning, A65LA18242-Y. Although a 1967 model it was registered in London on 1st of May 1968. My original Lightning also a 1967 -Y machine A65LA 18322-Y bought "new" by me was registered in Manchester on 1st of March 1968 and I know this to be still on the road. The above may be of interest to you. Just like we saw the left-over 1969 bikes being trucked to UK dealers that may have been the case in 1967 also.I think there is a chance that his first bike may have had the later sliders and TLS front wheel. I think the documents for the Dash Y bikes have been posted earlier on in this thread. That should be compulsory reading for those with the 1967 Dash Y unit twins. Their bikes have the newer 3 pipe oil manifold and revised points cam. This SB5-70 is an add-on to 2-70 and is announcing the new 180 day warranty to be applied to ALL BSA/Triumph bikes sold after 1 March 1970. This would cover the OIF ranges as well. There was a clause that the bike had to be a 1970 model and that older models were only subject to the 90 day warranty still. We are still researching, and seeking an answer to, how the later two groupings of Y bikes came to be. The Hybrid Spitfires of 1968 have 1968 features, including engines, but are still stamped with the 1967 style numbering. The last group we are researching is the Y bikes of 1969 and 1970. The despatch books show two dates for all of these bikes. The 1967 date has to be suspect as not one part of any of those bikes appears to have been made in 1967. We are undecided whether the bikes actually did ever exist and if they did then what became of them. All a little bit of a mystery.